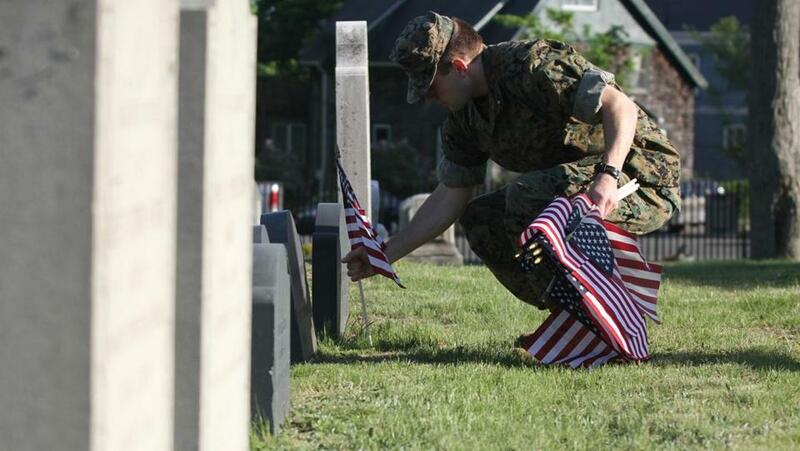 Beverly High School senior James Ryan placed an American flag on a veteran’s grave for Memorial Day. James Ryan is ready to take the first step toward his goal of becoming a brain surgeon. The 18-year-old Marine recruit will ship out Monday to Parris Island, S.C., for basic training, just eight days after graduating from Beverly High School. In a few weeks, Army veteran Jennifer Morand, a Framingham resident, will be certified in surgical technology. Later this summer, a rocket scientist from Middleborough, Kevin Geoffroy, will be promoted to major in the Air Force, and set out on his next phase of education. 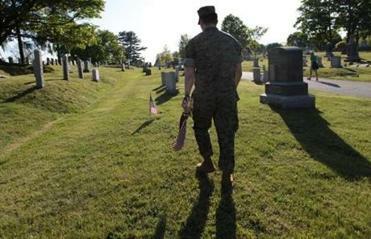 While most Massachusetts high school seniors head directly to college the fall after graduation, some embark on military service, and their numbers have been growing. Statewide, the share of high school graduates planning to enter the military rose to 2.4 percent in 2012-13, up from 1.6 percent in 2007-08. Although they enlisted in different branches of the armed services, Ryan, Morand, and Geoffroy are all taking advantage of the educational opportunities provided by the military, either before enlistment, while active, or at discharge. All are eligible for the post-9/11 GI Bill, an educational benefit intended to help veterans make the transition into civilian life, while at the same time developing a more highly educated and productive workforce, according to the Veterans Benefits Administration. Thomas M. McGovern, president of Fisher College and a US Army veteran, in a 2012 paper he wrote for the New England Journal of Higher Learning, says supporting veterans through their transition from the military to the workforce not only makes a significant impact on the service member, but the entire economy benefits. McGovern believes that without higher education, it’s likely the current 9 percent jobless rate among post-2001 veterans would be even higher. He estimates that 1 million service members, military spouses, and family members will reenter the civilian workforce over the next five years. Ryan began to focus on his future when he was in seventh grade. “I wanted a plan. What do I want to do and how can I get there?” he said. Ryan set upon a course to become a brain surgeon, but the costs of education made that goal seem out of reach. Ryan remembers worrying how he’d pay for his education, which he estimates will cost upward of $300,000. Then he came up with a solution: enlist in the military for the educational benefits. Ryan joined the Junior ROTC and the Marine Corps hooked him. Unlike Ryan, Jennifer Morand, 29, wasn’t ready to commit to the military when she graduated from high school in Milwaukee, Wis. She took time off before following in the footsteps of her mother, Army Major Katheryn Bruhn. “I wasn’t in it for the money and benefits,” Morand said, but rather to be part of something bigger than herself. “The military is a great experience, it makes good people. It makes good strong leaders.” She deployed twice to Iraq as a combat medic and was a sergeant when she was discharged. Morand gave up the military life when it came time to start a family with her husband, Army Staff Sergeant Shaun Morand, who is stationed at the US Army Natick Soldier Research, Development & Engineering Center . The couple had married in Iraq and last year settled in Framingham with their 3-year-old daughter, Madi. This summer Morand is graduating from the surgical technology program at MassBay Community College in Framingham and will continue her education this fall, using the GI Bill to become a registered nurse. For Captain Kevin Geoffroy, 31, the Air Force offered the best of both worlds — career and education. He graduated 14 years ago from Coyle Cassidy High School, a private school in Taunton, but didn’t make the first round of admission picks to the Air Force Academy in Colorado. He was ready to fall back on his next choice, Worcester Polytechnic Institute, but the Air Force called him on the second round of picks for the academy and he’s been high flying ever since. Since entering the Air Force Geoffroy has become a bona fide rocket scientist (astronautical engineer), but instead of wearing a white lab coat and working in a laboratory, he’s chosen to fly Pave Hawk helicopters on combat search and rescue missions. A decorated combat pilot, Geoffroy received the Bronze Star in Afghanistan and took part in the humanitarian relief operation after Japan was hit by a tsunami. He has been stationed around the world and taken part in military exercises in Japan, Norway, Jordan, the United Kingdom, France, Albania, Italy, and Scotland. Geoffroy — a self-described military career man — is presently stationed in Britain as an exchange pilot with the Royal Air Force, flying Merlin helicopters. Geoffroy’s path to the Air Force opened up when he discovered high school physics. “My favorite teacher was Sister Mary Catherine Burns, who was my physics teacher at Coyle, easily the best teacher I ever had. She got me hooked on doing physics, doing engineering, the real geeky stuff,” Geoffroy said. Physics led Geoffroy to enlist in the Air Force and his passion for astronautical engineering. While in the Air Force, Geoffroy has received a bachelor’s degree in astronautical engineering and a master’s in business administration. Geoffroy’s up for a promotion to major in July, and with it he’s eligible for continuing his education. “I’m standing by for my next phase of schooling,” he said. He is waiting for the Air Force Personnel Board to make a decision on the next step in his education from a “dream sheet” he submitted, which lists his personal choices. Alice C. Elwell can be reached at acelwell2@juno.com.